Still holding on at #1. Have you downloaded your FREE e-book? Also… The Voice for the Silent Fathers e-book is also on sale for $2.99 through Sunday! Get yours now! Voice for the Silent Fathers for… $2.99? That’s how serious we are when we say that we believe… EVERYONE needs to read this book! It’s about RELATIONSHIPS! Your’s, mine, OURS! 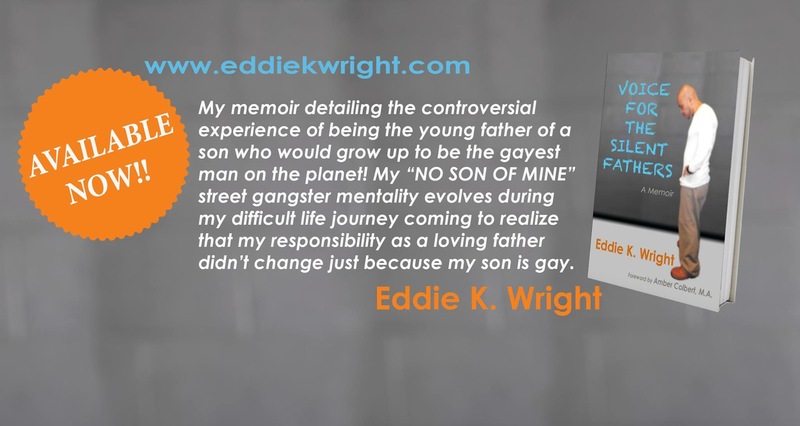 VOICE FOR THE SILENT FATHERS, Eddie K. Wrights memoir detailing the controversial experience of being the young father of a son who would grow up to be the gayest man on the planet! His “NO SON OF MINE! !” street gangster mentality evolves during his difficult life journey coming to realize that his responsibility as a loving father didn’t change just because his son is gay. While you’re at it… Why don’t you download Eddie’s introduction to his Gangster Turned Guru Presents: Series? It’s FREE till July 31st: Amazon.com! This E-Book will be available exclusively for Kindle at Amazon.com on July 26, 2016, for .99. Please visit this site or follow me on Facebook or Twitter so you can be the first to know when it is available. You can also join my mailing list by clicking HERE!